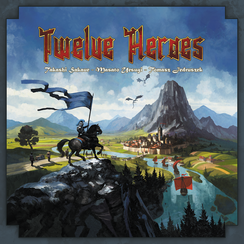 In the two-player game Twelve Heroes, players are landlords who lead twelve units and aim to obtain land cards which are located in three regions. These land cards give you victory points, and the first player who has gained seven points wins. Before the game begins, players choose twelve unit cards to construct a deck of their own. On your turn, you execute four phases: control, maintenance, income, and military. Military is the most important phase in a turn, during which you can muster, deploy, or move your units. You can also gain food. You consume action points to execute these actions. You need food to muster units and activate them. Managing food and maximizing synergies of units are the keys to winning the game.